One of my favorite watercolor technique is using salt. It is very simple, the results are beautiful and it beautifully combines science and art. 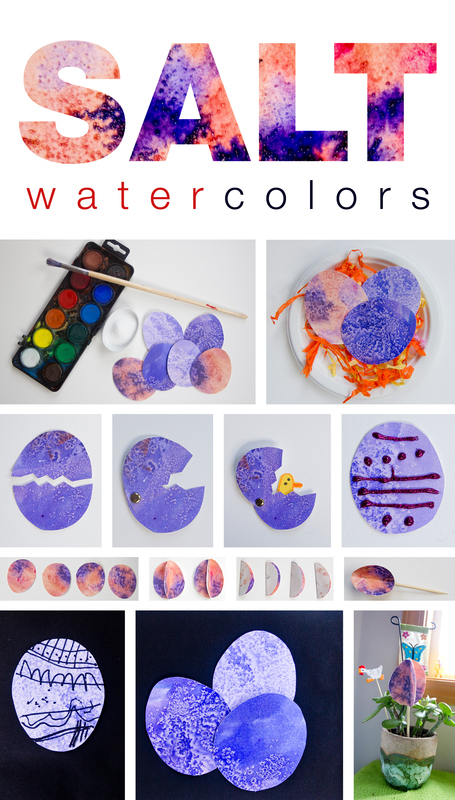 Let the kids use watercolors – any way they want to and when they are done (and the painting is not dry yet), sprinkle some salt on it (we used just regular salt but the rock/ice-cream salt is great too). Then let it dry, get the salt off and you are done… almost. Btw, if you want to explain your kids how the salt affects the paint… here is an idea I read somewhere. You may want to emphasize the idea that salt absorbs water by asking them how they feel after eating very salty chips. They get thirsty because the salt absorbs the water in their bodies just like it absorbs the water in their paintings. Simple for even a 3-year-old to understand. This entry was posted in Art Projects and tagged art, ArTree, easter, egg, kids, project, salt, watercolors. Bookmark the permalink.